Scoliosis is a back condition characterized by unnatural curvature of the spine. Usually scoliosis consists of two curves: the original abnormal curve and an additional curve that runs in the opposite direction that is caused by the body`s attempts to compensate for the original curve. Conventional medicine treats scoliosis by monitoring patients to determine if their spinal curvatures are worsening, but provide little in the way of preventive care for scoliosis. If the condition does worsen, conventional treatment approaches include electro-stimulation of the spine, back braces, and surgical procedures ranging from spinal fusion to the installation of rods along the spine to prevent further curvature. In stark contrast to these approaches, holistic health care practitioners take a far less drastic and less invasive approach in their treatment options to help reverse scoliosis. 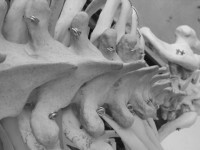 There are a number of different types of scoliosis, ranging from congenital scoliosis, meaning scoliosis that occurs due to birth defects of the spine, inflammatory scoliosis, which is caused by inflammation of the spine, and osteopathic scoliosis, which is due to deformities within the spinal vertebrae. By far the most common type of scoliosis, however, is idiopathic scoliosis, meaning scoliosis with no known cause, which affects people who are otherwise healthy and accounts for more than 80 per cent of all cases of scoliosis. Idiopathic scoliosis is divided into four categories based on a person`s age: infantile scoliosis (children 3 and under), juvenile scoliosis (children 3-9 years old), adolescent scoliosis (children and teens, 10-18 years old), and adult scoliosis, which occurs after a person stops growing in height. Of these subcategories, the most common form of scoliosis is adolescent scoliosis. The most common symptoms of scoliosis, in addition to the obvious abnormal curvature of the spine are shoulders of different heights, with one shoulder blade jutting out more prominently than the other; head not centered directly above the pelvis; a raised, jutting hip; different heights between the left and right rib cage; uneven waist; changes in the look or texture of the skin overlying the spine, such as dimples, hairy patches, and/or color changes; and tilting of the entire body to one side. The most common causes of non-idiopathic scoliosis are birth defects and other genetic conditions, neuromuscular problems, and leg-length disparity. Scoliosis can also be caused by disease conditions, such as cerebral palsy, muscular dystrophy, spina bifida, and tumors, all of which require prompt medical attention. Although conventional medicine claims there are no known causes of idiopathic scoliosis, alternative health practitioners disagree. From the perspective of alternative medicine, idiopathic scoliosis is primarily caused by misalignments of the spine (known as subluxations, according to chiropractic theory) and/or stagnation in the body`s flow of vital energy. Subluxations cause pressure to be exerted on the nerves that pass through the spine. Over time, this nerve pressure can cause muscles along the spine to tighten and contract along one side of the spine, while corresponding muscles along the opposite of the spine weaken. This causes the vertebrae of the spine to be pulled in the direction of the contracting spine, causing scoliosis. Stagnation of the body`s vital energy, known as qi by practitioners of acupuncture and traditional Chinese medicine, can also cause spinal muscles to tighten and contract, pulling the vertebrae out of alignment and causing the spine to become curved. Finally, one of the most common causes of idiopathic scoliosis, especially in teenagers and adults, is habitual posture, both while sitting and standing. As your poor posture habits become more pronounced, your body is forced to compensate. This compensation process can also cause muscle contraction and lead to scoliosis. Calcium and magnesium supplements can help your back muscles to relax, thereby helping to release chronic muscle contraction that is associated with scoliosis.